Last weekend, I crossed the country, bound for Disneyland California and a sprinkling of West Coast Pixie Dust. While I usually pack my pencils and ‘The General’ (my favorite eraser), on this trip there were stowaways in my carry-on tote. A travel set of Winsor & Newton watercolors and some roller ball ink pens accompanied me on my journey. I couldn’t record this trip in black and white. I needed color! Disneyland was a bouquet of inspiration for the senses. There was something truly magical about being bombarded by so many delightful sights, sounds, and smells. I was enveloped in a bubble of happiness where words like ‘diet,’ ‘excess,’ and ‘restraint’ don’t exist–A world where chocolate can be consumed in mass quantities without guilt and wild raucous laughter is completely acceptable. I didn’t want to leave, but reality tapped me on the shoulder and reminded me that I had duties back home. It was time to return to the land of housework, humidity, and homework. Besides, every great journey has to come to an end before you can begin a new one. Brayers, and presses, and ink! Oh, my! This week, I journeyed into the topsy-turvy world of print making where I encountered plexiglass, stencils, and a whole new medium–oil based ink. In print making, the ‘print’ is the mirror image of the inked design. As I watched my professor’s involved demonstration, I felt myself slipping into a bizarre, technicolor dream world. The layers, textures, and techniques made my head spin. Would I have enough courage to use the great and powerful printing press? Enough brains to master new techniques like the ‘rainbow roll’ and ‘chine colle’? Enough heart to design a meaningful print? Or would it be safer to just click my heels and go home? 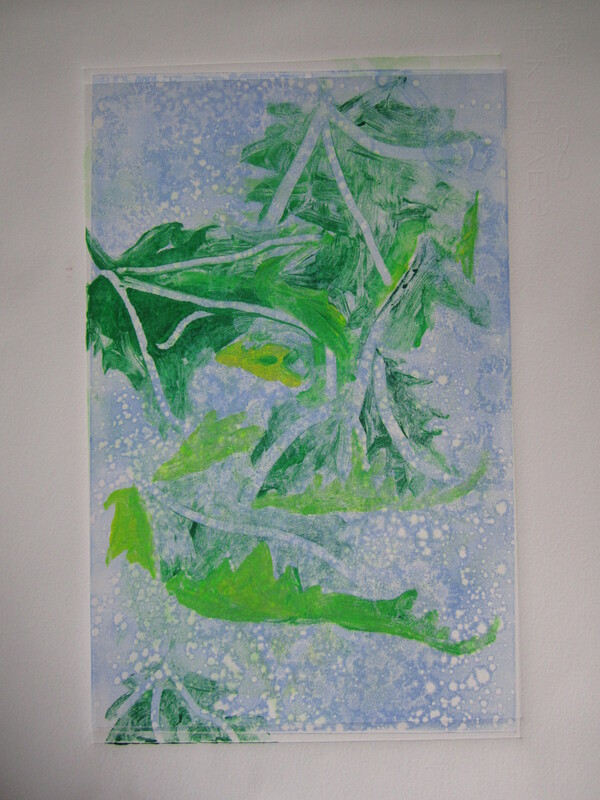 I decided to continue my journey into the fascinating world of print making. I followed the yellow-ink road, brayer in hand, turned the giant wheel of the press, and pulled back the printing blanket to reveal my very first monotype. There were definitely unexpected challenges along the way. The ink was thick and sticky, and didn’t glide like acrylic paint. The paper needed to be the perfect degree of ‘damp’ or the ink wouldn’t transfer properly. Too much ink, and I had a mess–not enough, and I didn’t get results. And even after the 30 minute clean-up–which involved a toxic blend of turpenoid, Simple Green, and baby oil–my skin, nails, and cuticles were stained a sickly shade of green, making me look just like the Wicked Witch of the West. After a week of print making, I stepped into my ruby slippers, clicked my heels together three times, and before I knew it, I was back in my own studio among familiar friends like natural bristle brushes and tubes of acrylic paint. I don’t need to wonder if my print making experience was all just a dream. The proof is in the prints–and under my fingernails. As much as I love exploring new destinations, there is something warm and wonderful about visiting a familiar hotel, a favorite restaurant, or an old friend. 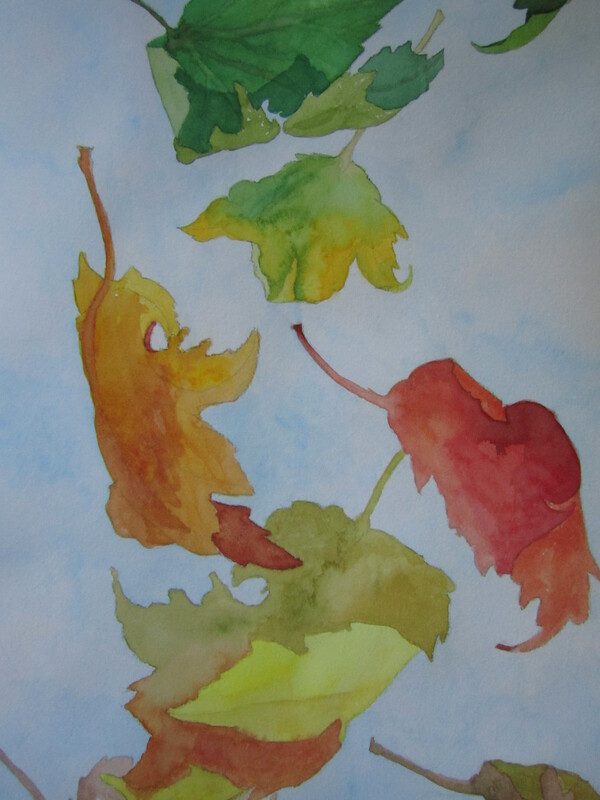 Last week, I had to suppress my joy when my painting instructor announced a watercolor project. While my classmates moaned, groaned, and complained about the difficulty of the assignment, I beamed at the thought of spending time with my favorite medium. I was nearly giddy as I pulled out my pristine Number 8 Round brush and unpacked my watercolor tubes. It didn’t take very long to get reacquainted with my old friends. Vibrant colors I hadn’t used in months came to life on my paper, ready to join me on my unexpected excursion. As we brushed our way through the assignment and breezed through the clean-up, I felt a twinge of sadness knowing my watercolors would have to be shelved for the rest of the semester. My acrylics were waiting patiently for the next leg of my trek. Is there room for multiple mediums on my Artist’s Journey? As I travel, I will undoubtedly come across materials, techniques, and ideas that I want to explore. There are plenty of undiscovered destinations out there just waiting to become ‘old favorites’. Maybe I just need a bigger suitcase. I often hear artists pleading to their muses for inspiration. “What should I paint, write, sculpt?” But who really needs a muse when inspiration is all around us? Open your eyes, step outside, take a walk, call a friend, talk to a stranger–What makes you laugh, cry, feel? Inspiration is everywhere. It’s in the air you breathe, the night sky, your child’s laughter. Inspiration is waiting in your imagination, your thoughts, your dreams. 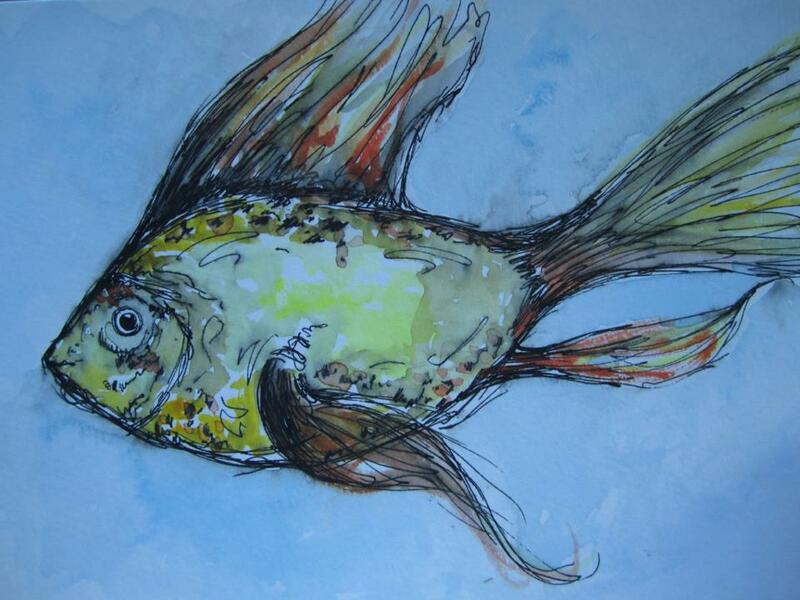 This week, my inspiration came from a simple pond. 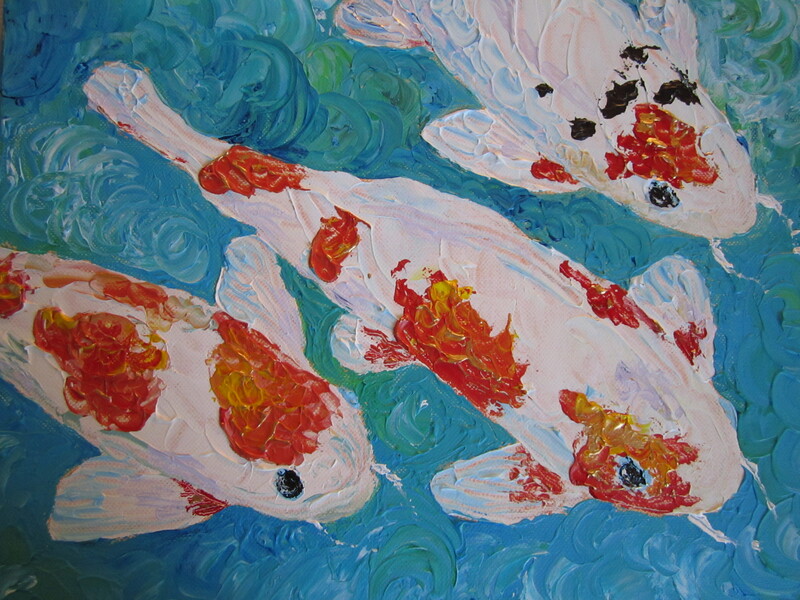 The koi swam gracefully as their vivid colors and patterns created a living mosaic that constantly changed like an animated kaleidoscope. I was captivated by the amazing colors, the reflections in the water, the awesome beauty of nature’s creations. I don’t have to look for inspiration–It always finds me. All classes were cancelled on the west campus of Valencia College last Thursday. For me, that meant an unexpected day off. Whatever would I do with an entire day off? As a wife and mother, I had an endless list to choose from: I could mop and vacuum, organize closets, clean out the fridge and pantry, dust, or do laundry–but the painter in me had a much shorter, completely different priority list: Paint. I certainly could have used the time to make corrections on my most recent series, but I had a hidden agenda. I had spent the last seven weeks tethered to a syllabus that delegated every brush stroke. On my day off, I just wanted to paint. And that’s exactly what I did. Even though I have absolutely nothing to hide, I get a little nervous every time I go through security at the airport. I’ve followed all the rules: my shoes are in the bin, all my liquids–under 3 oz. each–are labeled and stashed in a quart-size Ziploc bag, my laptop is out of my tote, and my boarding pass and ID are in hand, ready to be inspected. Still, it’s an uncomfortable experience. I hold my breath as I watch my carry-on travel down the conveyor belt into the x-ray eyes of the TSA agents. There’s always that gut-wrenching fear that I’ve inadvertently done something wrong, and the realization that I could be singled out–pulled from the security line and publicly frisked like a common criminal. I try to make eye contact with the TSA agent to assure him I’m a good person. Should I smile? Engage in a little small talk? Toss around some witty banter? But in the end, I make the wise decision to remain stoic while total strangers analyze and evaluate me. They glare, grimace, whisper, and point as they scrutinize my personal possessions. On my Artist’s Journey, this same degrading experience is known as a ‘critique’. Just like security, the ‘critique’ is a necessary evil to ensure a safe and successful journey. It keeps us in line, lets us know if we’re on track, and helps us see issues with our work. In the studio, we don’t have TSA agents, conveyor belts, or x-ray machines, but we do have a large wall where we display our work while our classmates and professor critique it with trained eyes. My work is always completed on time. It’s neat and as accurate as I can manage. I make sure to use the assigned medium and materials. I have invested time, effort, and heart in my work, and it’s hard to see it judged. I wince as my fellow artists dissect my color choices, technique, and style. Some make harsh criticisms, while others make honest assessments. Sometimes there is dead silence, and other times, there are genuine, heartfelt compliments. Like any seasoned traveler, I follow the rules. I show up on time, pin my work to the wall, and hope to sail through the critique so I can continue on my journey. Just like in the security line, I resist the urge to soften any upcoming blows with conversation or a smile. I stand tall, knowing I’ve done my personal best. And if a few stinging criticisms and sideways glances are tossed in among a sprinkling of sincere compliments, it isn’t so bad. Besides, there’s only one way to get on the plane that will carry me to my next destination, and that means going through security. Even when there’s a long line, a quibbling TSA agent, or a problem with my luggage, I will survive the experience and get beyond the critique wall–for I know there’s an amazing adventure waiting on the other side. Last week, I was an Italian pastry chef crafting an impasto piece, but this week, my journey took me to Paris, France to explore pointillism. Pointillism, developed by French post-impressionist Georges Seurat, is a painting technique using tiny dots of pure color that, from a distance, blend in the viewer’s eye. Sounds simple enough, right? If there’s one thing I’ve learned this semester, it’s that ‘simple’ can be a very deceptive word. Gone were the grand, glorious, sweeping brush strokes I had grown to love. They were rudely pushed aside and replaced by short, staccato taps of brush on canvas. Dots. Yellow dots. Red dots. Blue dots. Dots. Dots. Dots. Then the dots became spots, and the spots became a confusing mess on my canvas. I thought I was in Paris–The City of Light–The City of Love–But there was nothing ‘light’ or ‘lovely’ about my pointillism piece. This week, I was part painter, part Italian pastry chef. When my professor announced our latest assignment–using knives, not brushes–I was eager to load up my palette and get cooking! 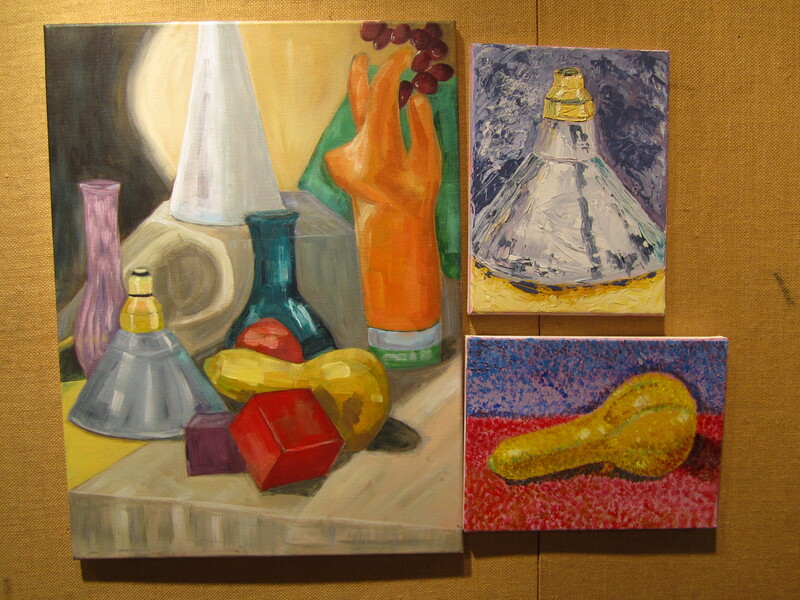 We were instructed to choose an object from our last still life and paint an impasto piece. I strapped on my apron, put down my paint brush, and picked up my palette knives. “Impasto” means ‘dough’ or ‘blend’ in Italian. 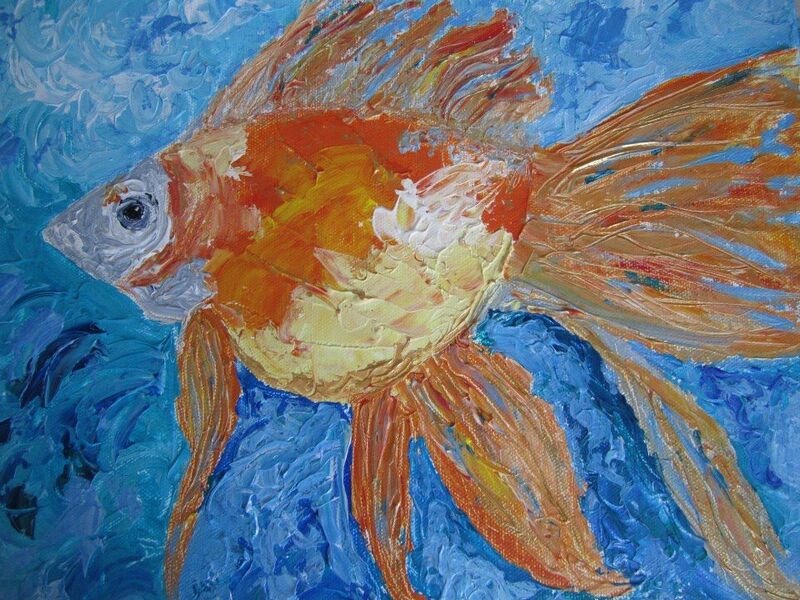 To work in the impasto style, you mix acrylic paint with thick, dough-like, textural molding paste and ‘paint’ with a palette knife. The goal is to create impressionistic, dimensional textures that convey emotion. I prepped my canvas with a bright purple ground as if I were flouring a baking pan. I mixed my paint and molding paste until it was a thick, rich consistency, then spread it on my canvas like creamy icing flavored with sweet blueberry, fragrant vanilla, and tart lemon. For me, it was just like frosting a cake–a really complicated, inedible cake…And while my mouth wasn’t watering in anticipation, and my nose wasn’t bombarded with decadent aromas, it was a treat for my eyes and my soul. Now that’s amore! While I love to paint, I’m never 100% sure of myself in painting class. Acrylic is a new medium for me, and I find myself in a constant state of internal conflict over my work. This week’s class assignment was a full color still life. It consisted of random objects placed together on a fabric-covered table. We were instructed to use a planar style of painting–more impressionistic than realistic. I watched our professor’s demonstration, made precise mental notes, and got right to work. 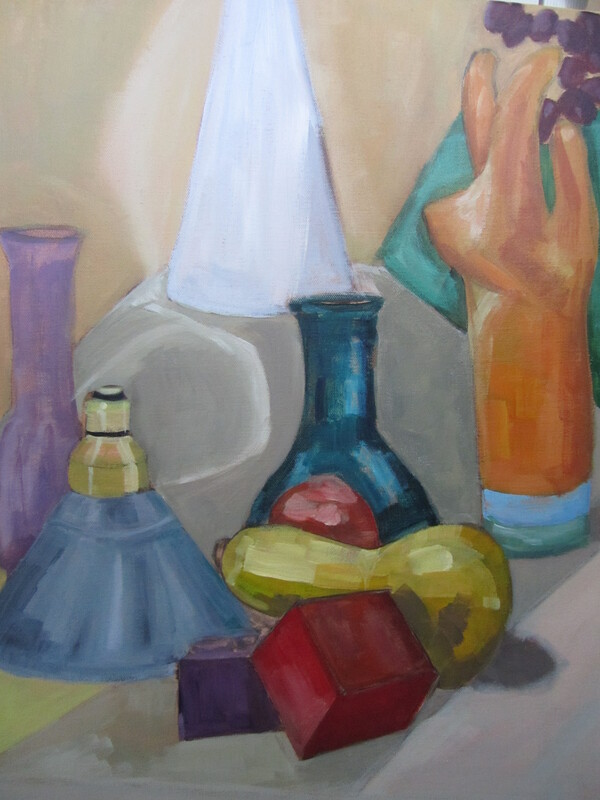 I mixed my colors carefully and made short directional strokes that defined the planes of each object in the still life. My instructor complimented me on my progress, and my confidence soared. I proudly forged ahead with a new-found certainty in my brush strokes. Madi, a fellow student and accomplished painter, strolled in late, set up next to me, and began painting the still life. Our professor encourages us to look at each other’s work, but when I glanced at Madi’s beautifully blended oil painting, I panicked. 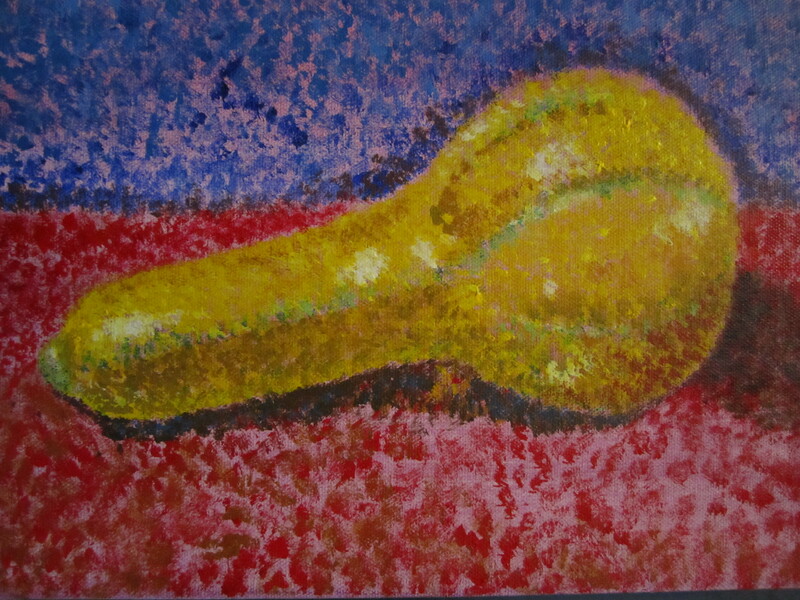 Suddenly, the acrylic impressionistic piece I was so proud of looked primitive and crude. I was instantly transported back to a junior high test, thinking I had written the perfect paragraph-long answer to an essay question until I looked at my neighbor and saw her page-long response. I instantly began to write more. I had to fill the page! Longer is better, right? Blended is better, right? I frantically squirted out a glob of “Matte Medium” and began to blend away all of the impressionistic strokes on my canvas. I could feel my professor standing behind me, and even without looking back, I could tell that her head was cocked in disapproval. “I looked at Madi’s beautifully blended work,” I confessed. “Oh…” was all I could manage as I mentally prepared to correct the damage I had inflicted on my painting. As I fell from the heights of Compliment Mountain to the lowly Valley of Corrections, I realized what I had done. I had let another student’s work define my own. Just because someone else’s work is longer, prettier, or more beautifully blended doesn’t mean it’s right–or better. I need to have more confidence in my own work and trust myself instead of always painting in a state of uncertainty. And maybe, until I’m a little more comfortable with this new medium, I should keep my eyes on my own paper. 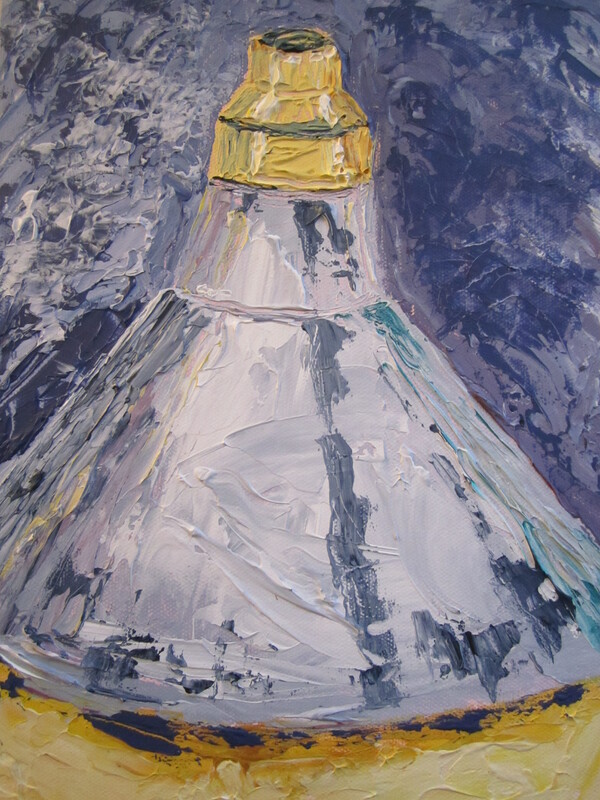 “We Three Kings”–my acrylic, planar, impressionistic still life–unfortunately, still in progress!